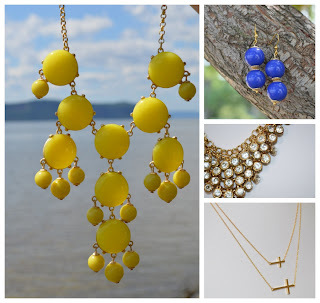 Where can you get gorgeous bubble necklaces, those classic sideways cross necklaces, and tons of other great jewelry? BlueBirdBride on Etsy has affordable versions of these trendy baubles, and she has great sales going on right now as well! Use code FALL2012 during checkout for 15% off. Diane, BlueBirdBride's owner, has generously offered to give away a $20 gift certificate to one lucky Look 4 Less reader during this holiday week!